Bobby Warner is originally from Clarksburg, West Virginia. After graduating from Liberty High School, he continued his education at West Virginia University. While at WVU he received two bachelor degrees and then attended law school. He graduated from the West Virginia University College of Law in 1998. In 2000 Bobby opened his own practice, Warner Law Offices, in Charleston, West Virginia. Bobby is an avid outdoorsman. He is an accomplished bowhunter, harvesting nearly 20 record book animals including whitetail deer, elk, bear and antelope. He is also an amateur outdoor writer, wildlife photographer and videographer. Whether it is fly fishing, elk hunting, deer hunting, turkey hunting or flushing grouse with his Brittany Spaniel Tucker, you will always find Bobby in the great outdoors. 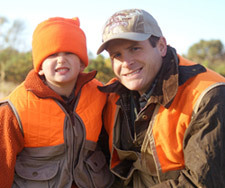 His true passion is hunting with his family all over the United States. He always includes his wife Michelle, his father Boyd and his brothers to share hunting camp together as a family. He is now actively getting his own children involved in the outdoors. Whether it’s hunting for shed antlers or fishing at the family pond, he is always quick to involve the entire family, especially his children Jackson, Riley and Gage. The experiences he shared with his father while outdoors encouraged Bobby to start Beyond The Backyard. Bobby realizes how important the bond is between those who share outdoor adventures together. Beyond The Backyard is an organization that will get West Virginia children more involved in the outdoors and give parents the tools that they need to get their children active in hunting, fishing and camping.